Das Land der Hottentoten an dem Vorgebrige der guten Hoffnung. A very scarce example of Bellin's 1747 map of southern Africa and the Cape of Good Hope. Covers from the Bay of St. Helena to Mussel Bay. Dutch settlements appear along the coast line with African tribal regions dominating the interior. Features excellent geographical detail, referencing swamps, mountains, forests and rivers. While the French edition of this map appears with some regularity, this, the German edition, is extremely rare. Compared to the French and Italian editions it is printed on much heavier stock and has a much darker impression. From the German edition of Provost's Voyages, edited and published by Johann Joachim Schwabe, Allgemeine Historie der Reisen zu Wasser und zu Lande (General History of Travel over Water and Land) . 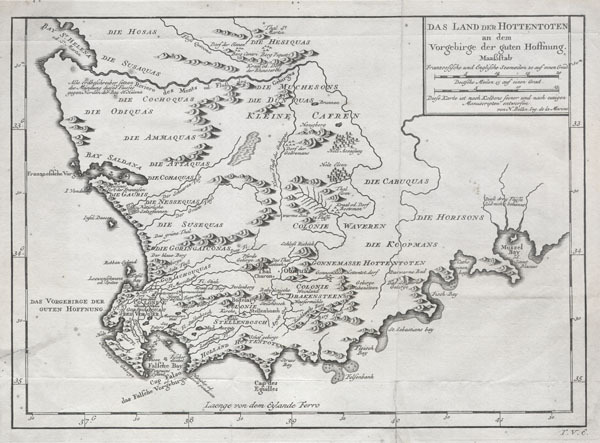 Johann Joachim Schwabe, Allgemeine Historie der Reisen zu Wasser und zu Lande, c. 1747. Good conditon. Original folds. Minor old verso repair on the left margin in extending slightly into the map, lower left quadrant. Older verso reinforcemtn on original fold line in lower right quadrant.